A Week in the Life of a Teacher (Week 13): Reclaiming MY Time! This week involved one day devoted to campus-wide testing. I originally was going to start a new topic but decided against it because of testing and our 1-week break for the Thanksgiving holiday. If you're curious about the title of my latest vlog, "Reclaiming MY Time," you can skip to the 3:03-minute mark. 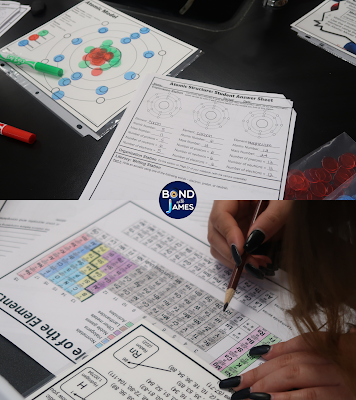 On Monday, my A-Day classes received additional support regarding naming and writing formulas for ionic compounds that contained transition metals and polyatomic ions. At the end of class, they took a quiz. However, the quiz involved dice that had ion symbols on each side. Students had to roll the dice to provide 10 ionic compound combinations. In the past, I usually would do this as a class activity. However, I wanted to try something different this year. On Tuesday, students either took the TSI (Texas Success Initiative exam) or an English benchmark exam. I had to proctor the TSI exam, and that turned out to be a nightmare. You can skip to the 6:30-minute mark in the vlog to hear the details on that. After the campus-wide testing ended, students had lunch and then reported to all of their B-Day classes. Since we tested until 1p.m., this meant that classes were 35 minutes long. I wasn't able to do everything that I had my A-Day students complete on Monday. 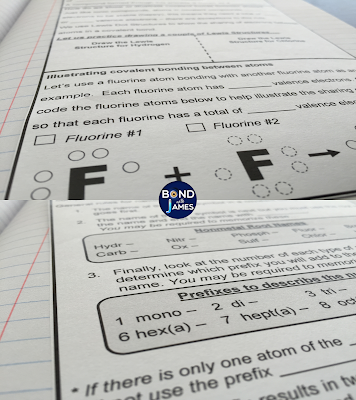 With that said, students were able to submit their answers from the Ionic Bonding Learning Stations from last week. 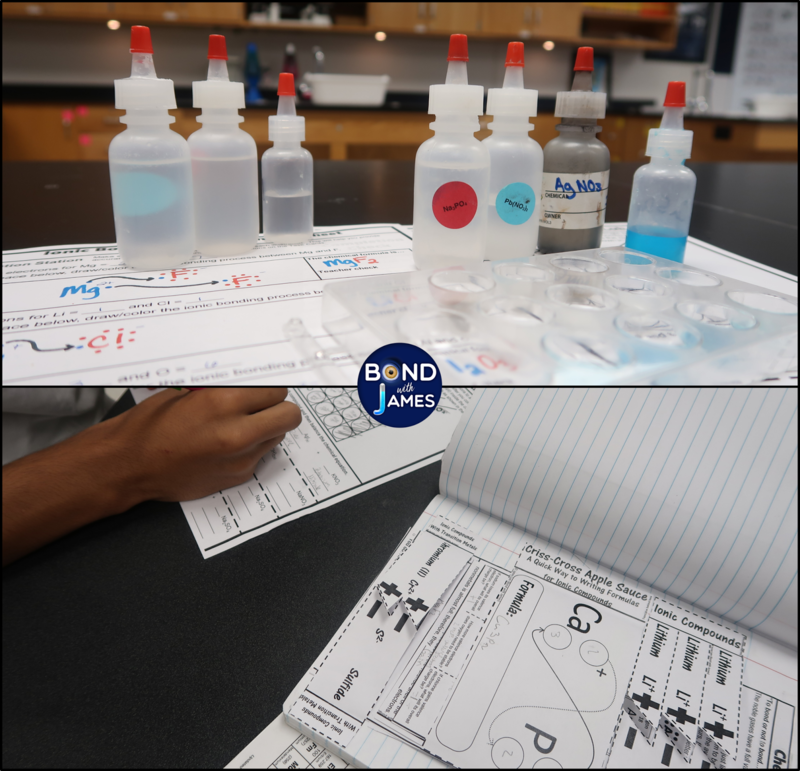 Wednesday was an opportunity for students to catch up with missing work or labs; or get extra practice with ionic compounds because that was the last day for that particular topic. On Thursday, my B-Day classes were able to complete what my A-Day students did on Monday; and Friday was also a repeat of Wednesday. Nothing too exciting this week except for the countdown until our 1-week Thanksgiving holiday break. We officially have 3 weeks after our return until the end of the fall semester. I have my calendar planned out and will work on putting the Covalent Bonding Learning Stations together over the break. I also started mapping out my plans for our return in the spring semester. I can't believe that we are halfway through the school year already; and that I actually pulled off vlogging every single week! To be honest, the vlogging did cause me to fall behind in regard to planning my semester. However, I made adjustments these last few weeks that have helped me maintain my sanity. I also have a plan for the vlogs upon our return from the winter break. My students are currently learning about ionic compounds and bonding. 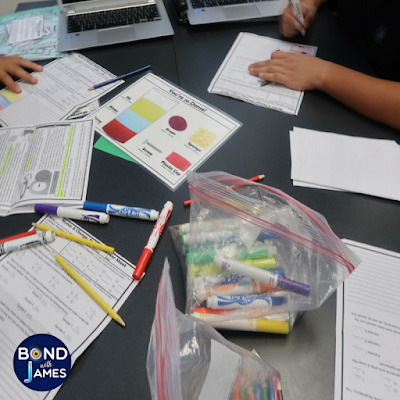 During this week, the students took notes, practiced with whiteboards, and participated in a stations reinforcement activity and wrapped up the week with a lab! On Monday, my A-Day classes repeated what my B-Day students did Friday; which is why I LOVE the A/B block schedule. 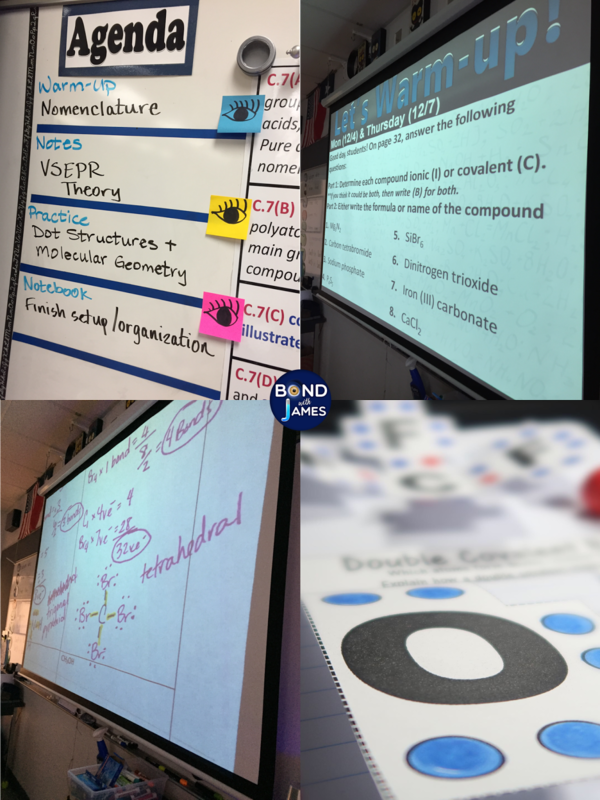 I introduced students to ionic compounds and the process of ionic bonding through the use of interactive notebook notes, as well as practice with whiteboards. 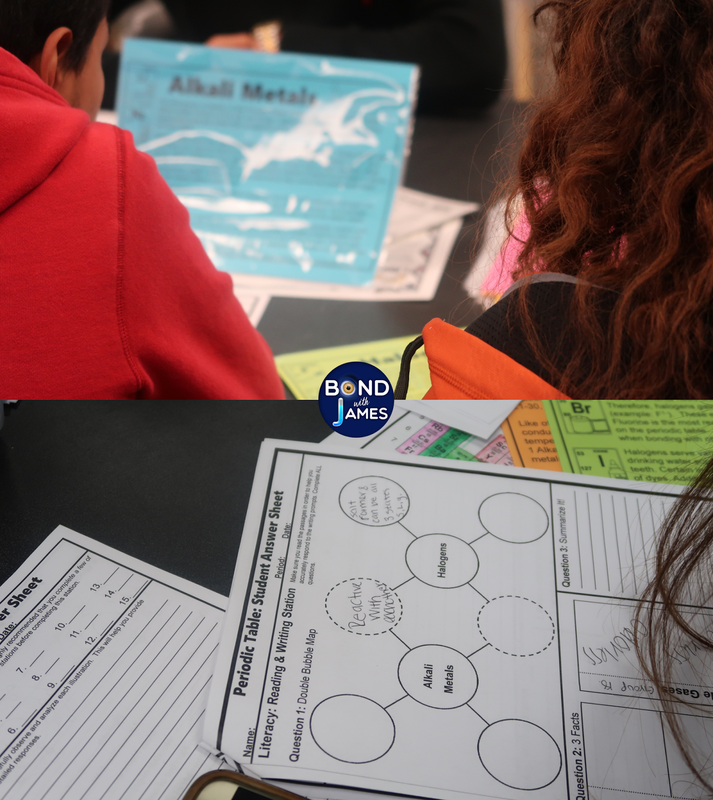 On Tuesday and Wednesday, my students participated in my Ionic Compound and Bonding Student Learning Stations. This set contained six stations (Literacy: Reading, Literacy: Writing, Exploration, Evaluation, Observation, and Organization). The stations were a great way to help me reinforce what I had taught last Friday (B-Day) and at the start of this week (A-Day). In my vlog, I speak at length about changes I made based upon frustrations I had with the implementation of the stations with my first class (you can catch it at the 9:00-minute mark in the video at the top). 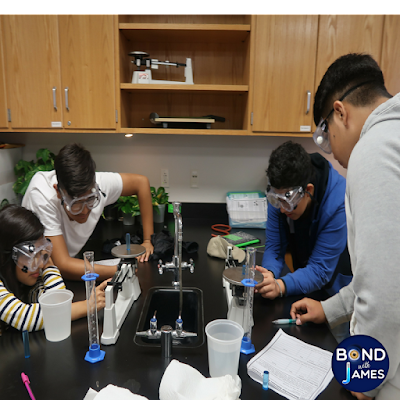 On Thursday and Friday, my students participated in a lab involving several reactions between various solutions of ionic compounds. 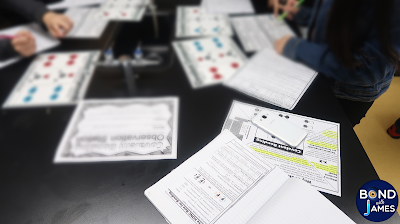 We actually started off the class with notes over polyatomic ions and depending on the class, we took notes over transition metals (as I had covered that with a few of the classes during the previous meeting). My students then had the opportunity to participate in the lab. The lab served as a real-world application of precipitation reactions (which we will revisit in the year) and an opportunity for them to practice writing names and formulas for ionic compounds. If you're interested in any of the activities, you can click on the links below. A Week in the Life of a Teacher (Week 11): Exams and Halloween! It's Halloween week! Join me as I share a "week in the life of a teacher" video highlighting my 11th week of school with students (for the 2017-2018 school year). A Week in the Life of a Teacher (Week 10): Evaluations, Frustrations, and Stations! Oh, my! This week was perhaps one of the more stressful weeks I've had since the school year began. You can watch the video to hear more about it or you can skip my frustrating moments and read about what my students did this week (below the video). Happy Mole Day! Unfortunately, I did not plan anything for Mole Day. I know, I know. I'm a horrible chemistry teacher. With that said, my A-Day classes repeated what my B-Day classes completed on Friday - which was the Periodic Table modules on the class Canvas site. I shot a video and edited it into seven smaller videos during my conference period last Thursday. 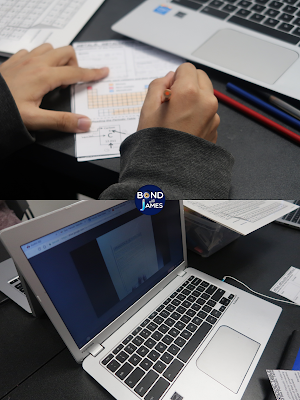 Then I uploaded each clip onto Canvas and created questions that went along with each video as a way to gauge student understanding as they watched and took notes. Unfortunately, the Teaching Gods were not on my side. Similar to the issue I had last Wednesday, none of the videos would play. I immediately decided to skip troubleshooting and teach the whole class. I had to do this for the first two periods of the day. During my off period, I remembered that I still had access to Google Classroom and decided to upload the videos there to see if that would fix the problem. Long-story short, I was able to get the videos uploaded to Google Classroom, but not without a cost. I had planned to shoot videos for future lessons but ran short on time because I had allocated a significant amount of time to troubleshooting the video issue. Oh, well! At least now I know I have a backup in case the Canvas video player does not work. On Tuesday and Wednesday, my students completed two of my Student Learning Stations activities: Atomic Structure and the Periodic Table. Students had participated in 3 other stations activities in the past. However, I incorporated two different topics into one lesson. I did this as a way to review material covered last week, to allow students to get up and move around, to interact with more hands-on activities, and let students choose the way in which they demonstrated their understanding of the material during the writing sections. There were also a few concepts that I had not taught and I used the stations as a method to cover them. Furthermore, my formal evaluation was on Wednesday and I had wanted to implement a stations activity set during an observation. Teachers receive two formal evaluations, by two different administrators, during the school year - one in the fall and the other in the spring. Both observations are approximately 30-minutes in length. I waived my pre-conference and sent my administrator a copy of my lesson plan outlining what my students would be doing at each station. I was able to get a feel of how the lesson would work with my Tuesday classes and made improvements after school that day. I took out two stations and also taped down all of the cards and station signage. This was to prevent students from mixing up the duplicate card sets at each table (which had been an issue during the other learning station activities); and it worked! I didn't tell my students that I was going to be observed. 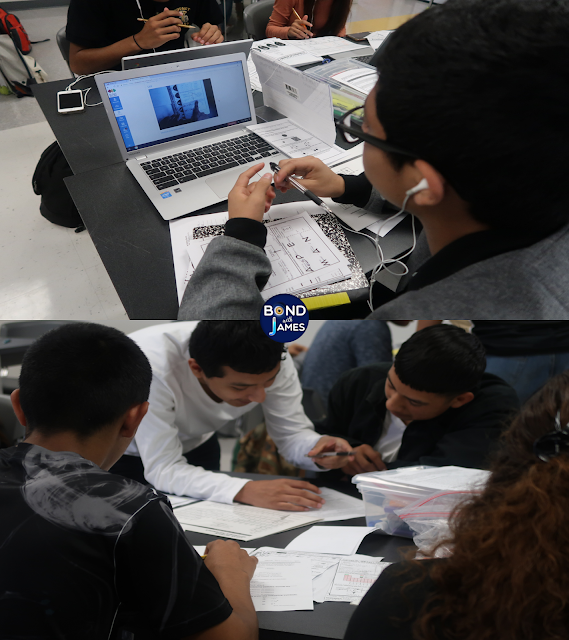 From the clips in the vlog, you can see that students were working individually or in small groups; as well as picking the order of the stations they wanted to complete. Students were engaged in higher-level academic conversations or tasks based on the specific activity they were completing. Overall, I felt that the evaluation went well. Now it's only a matter of time before I find out how I did during the evaluation. Thursday and Friday were days dedicated to completing the station sets. A majority of my students did complete the stations, however, I am on the fence about combining two topics in the future. 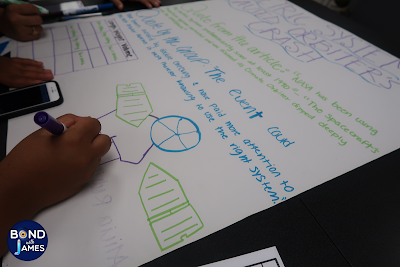 Actually, as I wrote the last sentence, I realized that I was really undecided about allowing some of the students to pick and choose during the station activities. These particular students did not utilize their time wisely and often start off the station activities together until I have to separate them. After four attempts at allowing them the choice to move around (based on previous station activities), I think I am going to direct their station flow in the future. If you're interested in hearing about my frustrating week or seeing more clips of students in action, you can check out the vlog at the top of the page. You can watch me talk about my missing COW key (computer cart), having to fill out student forms, waking up late, technology failures, and more! A Week in the Life of a Teacher (Week 9): Labs, Blended Learning, and Homecoming! 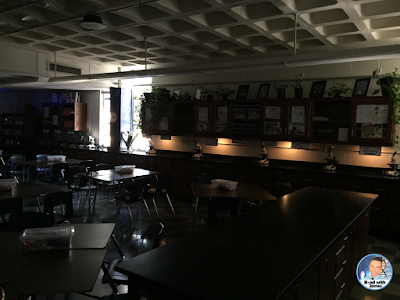 Homecoming week, labs, and blended learning during my 9th week of school! In addition to the weekly vlog, I've also detailed the week down below with pictures. In an effort to play catch up to my district curriculum (and compared to where I normally should be) I am combining two units. On Monday and Tuesday, my students participated in a chemical changes lab. I decided to leave out examples of physical changes and only provided experiments that demonstrated signs that a chemical change had taken place. 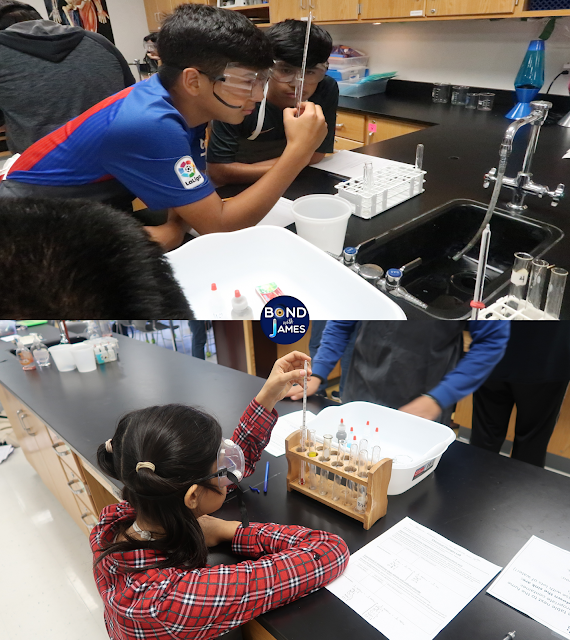 The students were engaged during the lab even though I provided materials for a micro-scale version of each of the reactions. 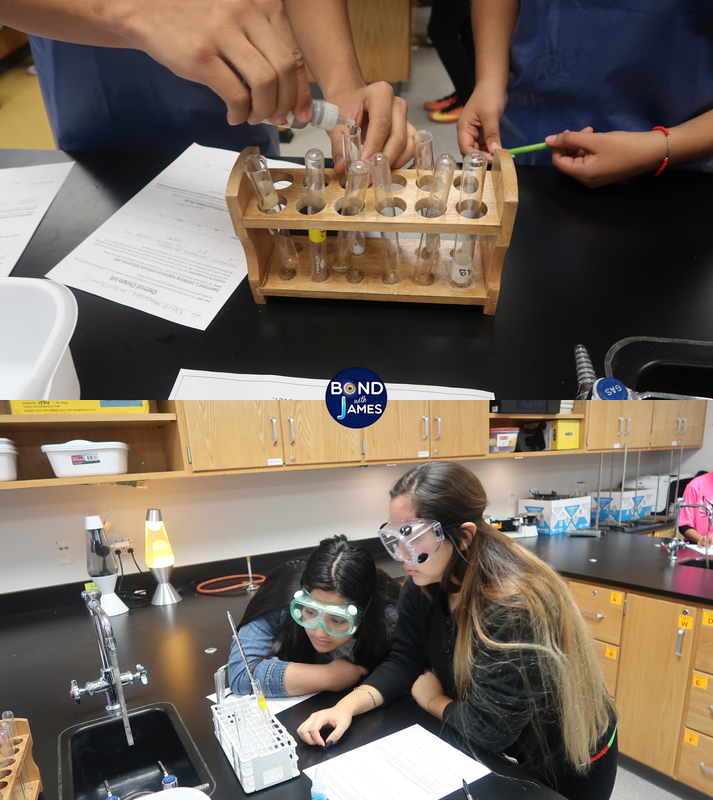 There still is some work to be done in regard to basic lab skills, however, the students were on task and completed the activities in a timely manner. I delayed the chemical changes lab because I was asked to hold off doing big labs with my students until my class sizes could be leveled to 28 students or less. To be honest, I also spent too much time on my Numbers in Science unit. On Wednesday and Thursday, I decided to teach atomic structure. I had shot a 20 minute video over atomic structure before I left work Wednesday evening. I split the video into six smaller videos, uploaded it a hosting site, and created questions in our Canvas program. The idea behind this was to allow students to watch the videos, take notes, and learn at their own pace. Unfortunately, my 1st period students had difficulty watching the videos because the videos kept buffering. I tried to troubleshoot, but my vision for this lesson was dead; at least for first period. I quickly flexed and taught the class as a whole, however, students had to return to the Canvas program to enter their responses. After first period, I used time during my advisory period to download all six videos from the host site and then I uploaded the files onto Canvas. Thankfully, this solution worked and my other periods were able to watch the videos uninterrupted. 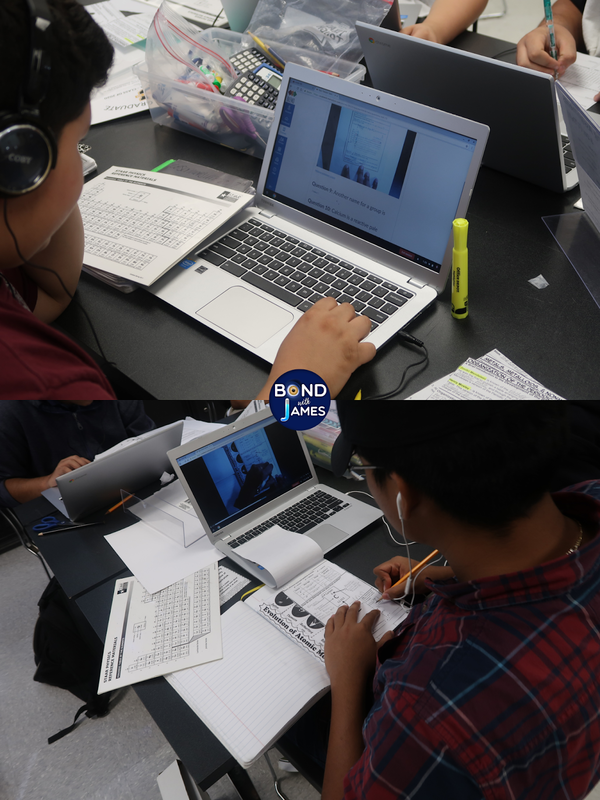 As students worked at their own pace, either individually or with a partner, I walked around the room to ask or respond to questions; as well as ensure that students were on-task with the blended learning assignment. The great thing about Canvas is that I can see which students are having difficulty and develop a tailored lesson just for them. I also had to make a decision about topics to cut out from this particular unit (which I'm combining with the previous unit). For example, I decided to scrap isotopic composition; or at least push it to nuclear chemistry toward the end of the school year. Students will still be required to know what an isotope is, but they will not learn how to calculate the average atomic mass. Since I made the decision to combine atomic structure with my matter & change unit at the last minute, I did not have time to give students all of the handouts; so we used a few minutes in class to prep interactive notebooks. I requested my formal evaluation to be conducted on Monday of next week. 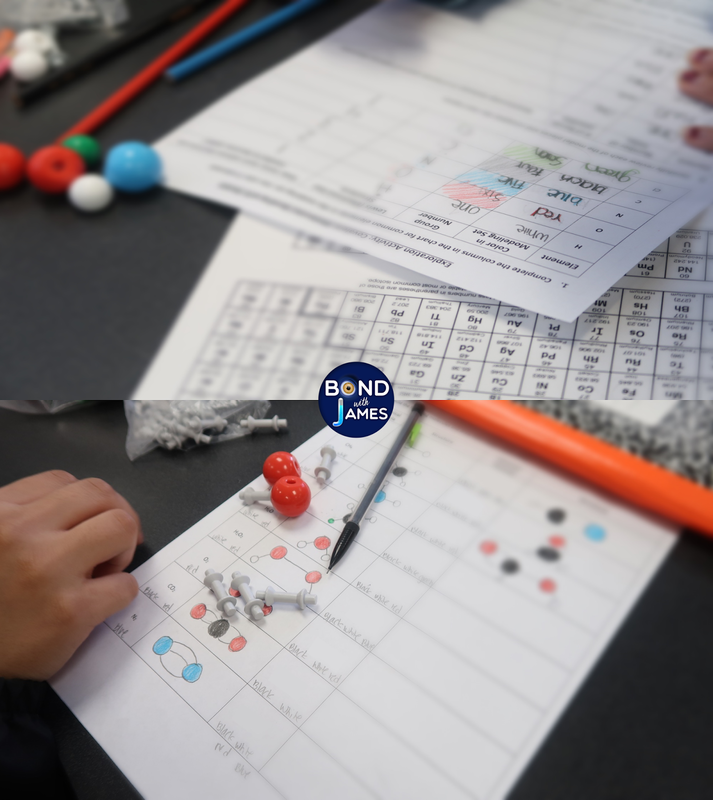 I have decided to combine two Student Learning Stations for the evaluation: Atomic Structure and the Periodic Table (mainly because I need to catch up) . I've done stations during previous evaluations and my students have done three other learning stations. I'm not worried about doing two different stations because I've had duplicate sets of a single version during previous lessons and the students did fine. Students should be able to complete all of the stations since I will be using them as a wrap up to the concepts covered in the blended learning lessons. A Week in the Life of a Teacher (Week 8): PD, PSAT, and Demos! This high school teacher vlog highlights a 5-day period of the eighth week of school during the 2017-2018 school year. 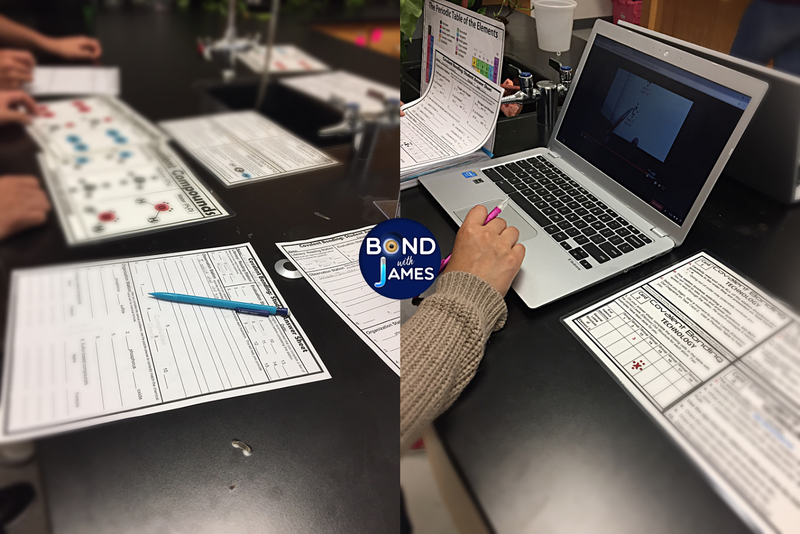 Watch as I show clips of students working on chemical equations to me demoing a few chemical reactions. 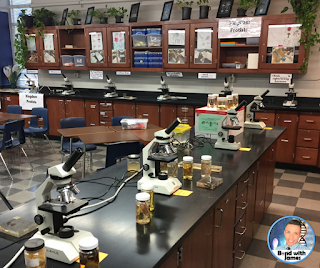 A Week in the Life of a Teacher (Week 7): Labs, Quizzes, and Subs! The vlog highlights a 3-day window of the seventh week of school during the 2017-2018 school year. I show clips of students participating in a density lab, taking a quiz, and me talking about preparing for a substitute. This week marked the beginning of a new six-weeks grading period - the 2nd six-weeks. I started off the week making new hall ticket passes for all of my classes. You can check out my hall ticket video here (I talk about what they are and my motive for doing them). 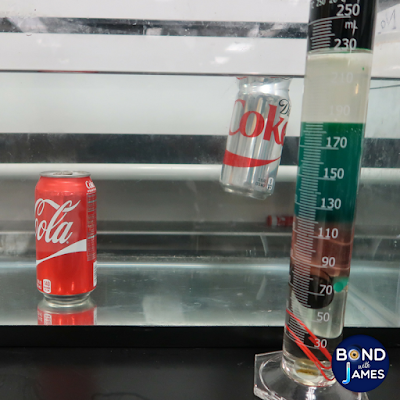 On Monday, my A-Day classes participated in the density cylinder lab. My B-Day classes did this on Friday. Each group of 4 received a tube containing four pieces of a particular substance. However, they worked in pairs, and each pair took two of the pieces to determine the densities. After, the pairs switched pieces so that all students at a particular table had the opportunity to establish the densities of all four pieces. The purpose of the lab was to help students observe that the density of an object is an intensive physical property (the size/shape of the object doesn't matter). On Tuesday and Wednesday, my students took an online quiz over density. I had created several videos of myself teaching the various density calculations and had given students over a week to watch the videos. Unfortunately, this did not go over well because I had a large number of students that had not watched the videos and it showed during the quiz. However, with all of my quizzes, I do allow retakes if students come in for tutoring. 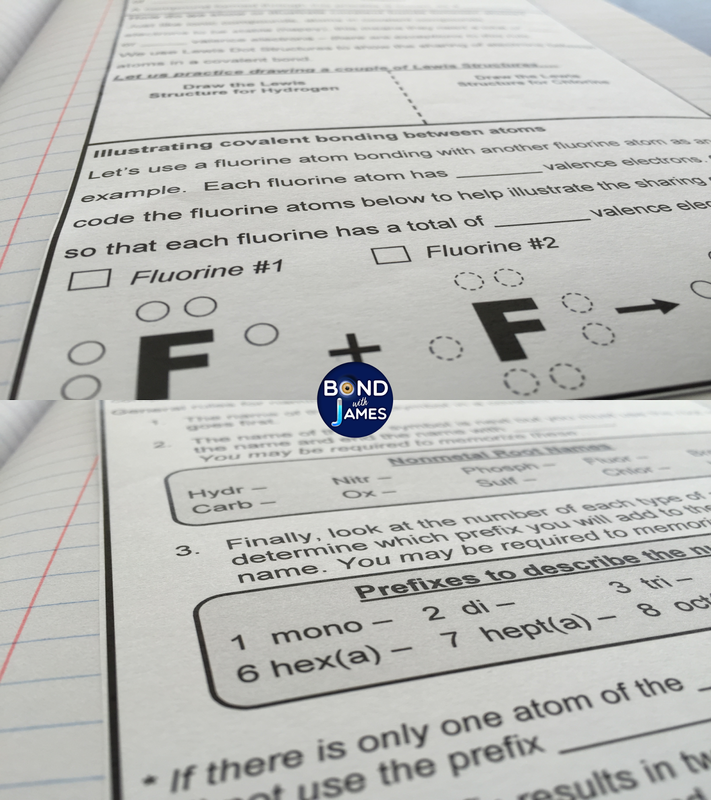 After the quiz, I began teaching students how to read chemical formulas, and I also started an introduction to balancing chemical equations. I figured I could introduce a topic and leave something general over these concepts with the substitutes on Thursday and Friday. I did not make the sub assignment too tricky, but I did leave something that would challenge them while I was out. Planning for a sub is a pain; at least for me! I ended up leaving late because I had to put up equipment and prep the sub work for my students. I still hadn't even packed for my trip to New York, and I had a flight at 5 a.m. the next morning! Although, in retrospect, I should have planned a little earlier and thought I could quickly do everything at the last minute. I was wrong. The following vlog highlights a 5-day window of the sixth week of school during the 2017-2018 school year. Below the video I discuss specific aspects of my week in more detail. Students completed another stations activity this week, the Matter & Change Student Learning Stations. Since our school will be a 1:1 campus in the spring, I wanted try my hand at a blended learning environment. I've done this before, however, technology has changed since I was last in the classroom (and I'm also part of the tech committee at my school). A few of the activities were hands-on and the other stations were placed on the class Canvas site. While students were doing this, I asked a table group of students to come to the back of the lab area so that I could teach them how to use a Bunsen burner. On Thursday, my dual-credit chemistry class visited the University of Texas at Austin. Unfortunately, many of the students were not able to attend because they had extracurricular commitments on the same day. However, fun was had for the few students that did attend the field trip. Perhaps I enjoyed it a little too much because it was my first field trip in over 10 years. On Friday, my B-Day classes participated in a density lab. Prior to that, students had to sketch the objects I had on my mobile demo table. While there were four students at a lab table, I arranged the activity so that students had to work in pairs. I've done this particular lab before and it has also worked out well in pairs versus a group of four. I am going to complete the same activity with my A-Day classes on Monday. Stay tuned! 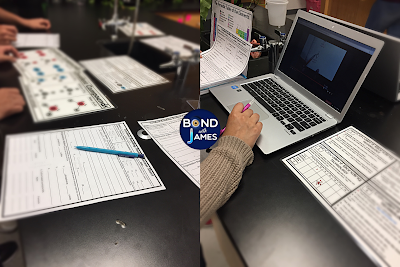 A Week in the Life of a Teacher (Week 5): TRTW, Collaborative Posters, and Class Filming! The vlog highlights a 5-day window of the fifth week of school during the 2017-2018 school year. Watch as I show clips of flexible seating, introducing two new instructional strategies, and talk about my current frustrations. You can also check out pictures and additional details below the video! During a staff development last school year, I was introduced to a process known as Talk, Read, Talk, Write (TRTW). I'll spare you with the small details, however, I remember it was a process that I immediately implemented. Although, after reading the book this past summer, I realized that I had implemented a majority of TRTW incorrectly (as described by its author, Nancy Motley). As I planned for this school year, I knew that TRTW was a process that I wanted to incorporate in my class to help increase literacy in my classroom. My second period class was filmed on Wednesday of this week, however, I had originally planned to give the first test of the year on Tuesday and Wednesday. Therefore, I decided to push the test back a class day and come up with a collaborative review that would help students with concepts we had been covering leading up to this week. I decided to combine the TRTW process with a collaborative poster (which I've written about here). For Talk #1, I provided a picture prompt with two guiding questions. I gave students 2-3 minutes to jot down their thoughts and then gave 3 minutes for them to discuss with the people at their table. After, I had asked for volunteers to share what was discussed at their table; or I used Popsicle sticks to call on students if no one volunteered. 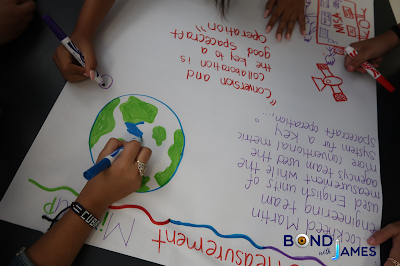 Then they read an article that connected topics that they had learned in class to a real-world event. Prior to the reading, I had given the students a Pay Attention to List, which outlined some important ideas to help guide their reading; as well as a strategy known as Highlighting Plus. Next, students engaged in Talk #2 for 2-3 minutes and then shared out with the class. I did modify the process and left out the individual writing component for another time. Although, students did do some writing on the collaborative poster. With that said, the posters came out great. Normally, I would have students present to the class, however, I am behind curriculum-wise and could not afford to push material back any longer. Feel free to leave questions in the comment section below! 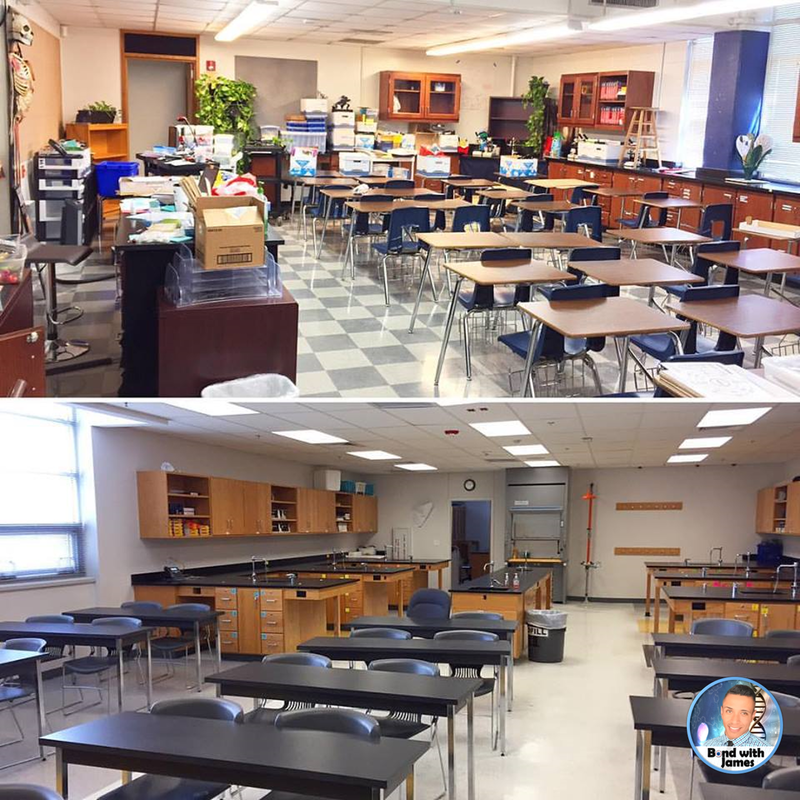 A Week in the Life of a Teacher (Week 4): Flexible Seating, Lab Practical, and Fire Drills! This high school teacher vlog highlights a 5-day window of the fourth week of school during the 2017-2018 school year. Watch as I talk about the implementation of flexible seating, managing a lab practical and experiencing our first fire drill of the school year. This high school teacher vlog highlights a 5-day window of the third week of school during the 2017-2018 school year. Watch as I talk about feeling sick to dealing with a stressful day and rebounding to students engaged in a lab activity. This vlog highlights a 5-day window of the second week of school during the 2017-2018 school year. Watch as I talk about how the campus was indirectly impacted by the events of Hurricane Harvey to me showing a few clips of students setting up their interactive notebooks. I also shared of few clips of the students participating in a "Get-to-know-you" activity, an exploration activity, and another set of learning labs. This teacher vlog highlights a 5-day window of the first week of school during the 2017-2018 school year. Watch as I talk about the school losing power on the first day of school to me showing a few clips of students engaged in learning labs and writing activities through the remainder of the first week of school! The tag was created by SmartieStyle (on YouTube) a few weeks ago. However, I started school on August 21, 2017. I shot my First Day Jitters Tag video the night before while I was trying to do a dozen other things (not recommended and perhaps why I called my shoes, "slacks," in the video). Feel free to share your first day jitters in the comment section! Thanks for watching! This vlog highlights a 5-day window when I went up to my school to finish organizing my classroom. This is the final week of summer vacation before teachers have to return to school. Based on my experience as a teacher and administrator, I know that I would not have enough classroom preparation time once we returned. Therefore, I made a trip up to the school to allow myself sufficient time for setting up my classroom. This video mainly focuses on the final touches to my painting jobs and the addition of tennis balls for my student tables. Although I did some other classroom organizing, I did not highlight that in this vlog. Furthermore, I did not want to give too much away because I want to reveal it all during my Beginning of the Year Classroom Tour video. Stay tuned! If you have any great ideas for organizing my classroom or general classroom organizing ideas for teachers, then please leave them in the comment section below. 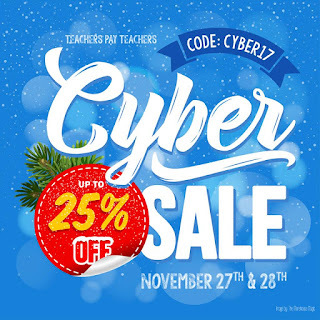 I would love to hear from you; as would other teachers! Thanks for watching! Summer vacation is coming to an end and the time to start prepping for school has returned. As you get ready to return to work, here is a 1-minute Back-to-School video tip to help save you time. This is something that I've done for several years and even provided teachers with their own versions when I was a district-level science instructional specialist. If you wish to participate in my personal giveaway (win one of four $25 TpT gift cards), then simply complete the information in the Rafflecopter below. Please note that you will be asked to verify your status as a secondary science teacher (current or former). This is to prevent unsolicited entries into the giveaway. 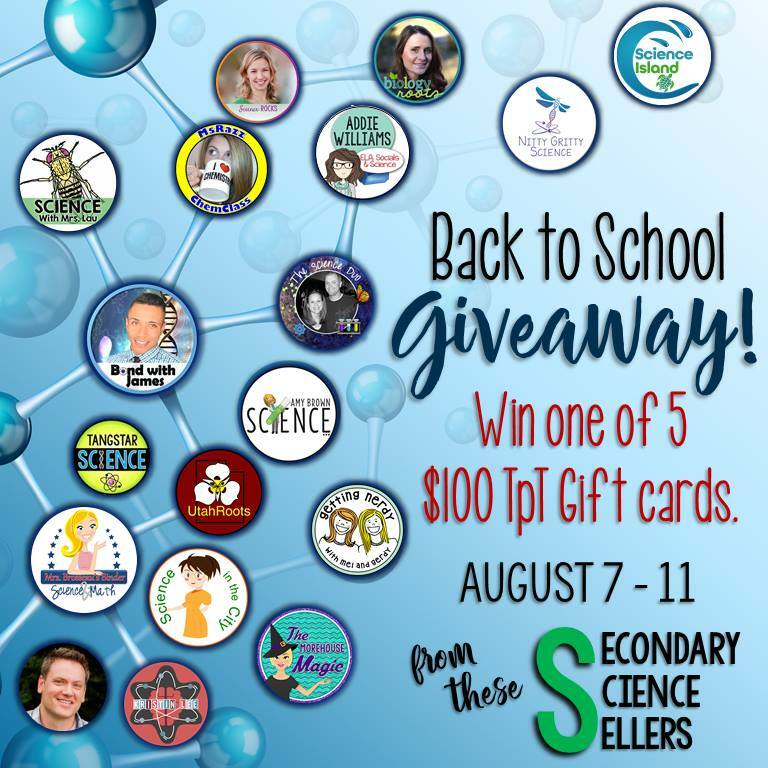 In an effort to support science teachers, I have teamed up with 17 awesome science educators for a Back-to-School Giveaway. 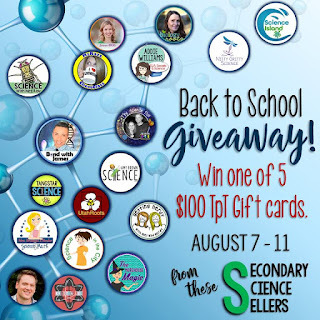 We are giving away FIVE $100 gift cards to Teachers Pay Teachers! 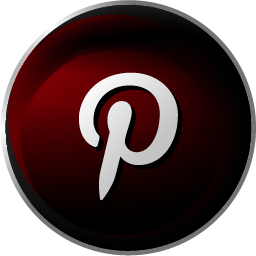 First, you will need to use the inlinkz linkup (bottom of the page) to hop from blog to blog. Secondly, as you visit a participating blog, make sure to gather a code word from each science educator. My code word is 19. Claude. Finally, string together the code words in order to create a sentence. Submit your answer into the rafflecopter box to enter the Back-to-Schol Secondary Science giveaway (directly below). Giveaway ends August 11th, 2017 at 11:59 PM EST. Open to Residents of the Earth only. Winners will be selected at random and be notified by email. Winners have 48 hours to confirm their email addresses and respond before a new winner is selected. The product offered for the giveaway is free of charge, no purchase necessary. My opinions are my own and were not influenced by any form of compensation. Facebook, YouTube, Twitter, Pinterest, and Instagram are in no way associated with this giveaway. By providing your information in this form, you are providing your information to me and me alone. I do not share or sell information and will use any information only for the purpose of contacting the winner. Join me as I vlog about my Day 1 classroom prep for the upcoming 2017-2018 school year. I also talk about student group bins! This vlog highlights a 3-hour time period when I went up to my school to start organizing my classroom. Teachers have 1 week of summer left (after the shooting of this video) before we have to return. Based on my experience as a teacher and administrator, I know that I would not have enough classroom preparation time once we returned. Therefore, I made a trip up to the school to allow myself sufficient time for setting up my classroom. I also take some time to discuss my student group bins (boxes). I showed these in my End-of-Year tour video last year. However, I forgot to come back around to explain what I actually had inside. I've used group bins for a majority of my career and believe that the bins are one of the many awesome classroom organizing ideas for teachers. If you have any great ideas for organizing my classroom or general classroom organizing ideas for teachers, then please leave them in the comment section below. I would love to hear from you, as would other teachers! Thanks for watching! Subscribe and Bond with James, so that you don't miss updates on my life as a teacher! If there's anything you liked about the video, then don't forget to Like or comment! Chembridge is a dual-credit course offered through the University of Texas at Austin. The program is part of the Pre-College Academic Readiness Program (through a division that oversees diversity and community issues on campus and throughout the state). The course is taught online by a University of Texas professor. High school teachers co-teach in person at their respective campus. Students also receive 6 hours of college credit upon successful completion of both semesters. I inherited the course from a teacher that had left at the end of last school year (and she had inherited it from a teacher that had left mid-semester last year). I had previously co-taught the course approximately 10 years ago. Chembridge has undergone faculty and programmatic changes since then. In the video, I share my experiences over the week of July 24th - July 28th - everything from traveling to campus, to fighting and surviving allergies, and working problems that my students will work on throughout the school year. Join me as I participate the in the #iteachtoo Teacher Tag, created by my fellow teacher YouTuber, Too Cool For Middle School. The #iteachtoo teacher tag is a series of 10 questions, posted below, that participants answer about themselves to help their audience get to know them better. Play along and share a little about yourself in the comments section so that I get to know a bit about you; especially if you are a secondary teacher. How did you get involved and can I join? --I came across the #iteachtoo Teacher Tag through the YouTube recommended list. I noticed a lot of videos with the #iteachtoo tag and wondered what was going on. After watching a few, I realized that it was a collaborative opportunity, created by Megan, of "Too Cool For Middle School", that allowed people to participate in voluntarily. Prior to this, I had not really shared information about myself similar to the info that I shared in my #iteachtoo video. So, hopefully, you were able to learn a little more about who I am as a person and a secondary science teacher! 1. What do you teach and where? 3. Did you always know you wanted to be a teacher? 4. What is your typical #teacherootd? 5. What do you usually bring for lunch? 6. What is one of your favorite books about teaching? 7. What is one of your favorite teacher movies? 8. Who was your favorite teacher? 9. Who are some of your favorite teacher YouTubers/instagrammers/snapchatters, etc? 10. What is one of your best classroom management tips? 11. What is one reason you decided to become a teacher? Join me as I share my student teaching experience, as well as my experience as a collaborative teacher (host) for student teachers. What was your student teaching experience like? While my student teaching was 15 years ago, the experience is still fresh in my memory. Perhaps I remember it so well due to my anxiety and the fact that I basically taught the two courses unsupervised. Regardless of that particular situation, it still was a great experience. I was fortunate enough to complete student teaching assignments at various primary and secondary schools; however, my semester-long experience is the event that I speak about in this particular video. I also had a few stints as a (host) cooperating teacher for several student teachers. I shared my last experience - which was 7 years ago before I left the classroom for various instructional leadership positions. In all cases, I made sure to allow my student teachers the opportunities to experience the life of a teacher (or at least as close as possible in order to make their transition a little easier). If you're thinking about becoming a teacher or about to start your student teaching assignment, then, as I repeated SEVERAL times in the video, take advantage of all the opportunities and commit yourself to the experience. Best of luck on your teaching journey and I hope I was able to provide an alternative insight to a topic you may have already come across. Have a great day! Feel free to share in the Comments section (here or on my YouTube channel). Also, if anything in the video resonated with you, then make sure to Like and/or Subscribe so that you can receive weekly vloggin updates! I decided to make this video because people always ask me why I made the decision to leave higher positions and return to teaching. I returned to the classroom during the 2016-2017 school year and taught science (biology and environmental systems) at a Title 1 high school. Prior to that, I was a campus assistant principal (at the same school) and prior to that, I was a district-level science instructional specialist for high schools. Join me as I discuss my poor curriculum design process as a new teacher and how I eventually developed those skills; which helped me later on in my career (as a district instructional specialist and campus assistant principal). If you are unfamiliar with the Backward Design process or wish to advance your career as an instructional leader (administrator, department chair, or instructional coach/specialist), then I recommend reading the book, Understanding by Design, by Wiggins and McTighe. Furthermore, the framework serves as an excellent curriculum model to assist you in the development of your yearly curriculum. The book goes into much more detail than what I shared in the video. For example, the book describes how teachers should unpack (and repack) their learning standards. It also talks about mistakes of curriculum development - coverage and activity-oriented design; which is referred to as the "twin sins" of traditional curriculum design. The book is also packed with K-12 examples and a few templates (additional templates are available in supplementary UbD resources). Purchase the book, Understanding by Design, by clicking here. Subscribe, and Bond with James, so that you don't miss updates! Join me as I begin my YouTube teacher vlogging adventure! The purpose of my vlogs will be to share with others the weekly life of a high school science teacher. Whether you're looking to become a teacher, or you're a novice teacher or a veteran teacher, hopefully, you will find something of value from each vlog. Perhaps with enough time and experience, I can turn it into a daily vlog. Subscribe, and Bond with James, so that you don't miss updates! Below you will find pictures and a video showcasing my classroom as the 2016-2017 school year comes to an end (EoY = End-of-Year). The video was shot two weeks before the end of the school year. Here is a picture I took two weeks before the start of school (top) and a picture I took two weeks before the end of the school year (bottom). Check out the videos below for more features and an explanation of the setup. I also included the Beginning-of-Year (BoY) video below if you're curious to see the changes. Small warning: I shot the BoY via Facebook Live and my reception was poor at the very beginning. This will explain why the quality is not a clear when you start the video. While I enjoyed how my room turned out for the '16-'17 school year, I will be switching rooms for the upcoming year as one of our teachers took a position in another district. I am going to take time over the summer to move rooms and begins working on the new area (so that I don't have to worry about the Back-to-School rush and hassle). 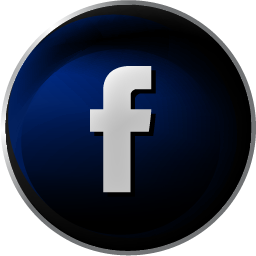 If you're interested in more, you can find frequent postings on Facebook, Instagram, and YouTube. An out-of-control class is a nightmare! I've had several throughout my career. So, how can you reclaim your sanity; or at least have more positive days than negative days? I created this video in response to a video meme by BoredTeachers and Nicholas Ferroni. The video made me laugh, however, as I scrolled through the Facebook comments, I had noticed that the clip made other people uneasy. I also noticed that were several people that had requested advice for how to deal with a situation similar to the meme. I responded in the comments, but then decided to create a response video after recalling my 5th-period class during my first year as a teacher. In the video, I share strategies that I've employed over the years to help me combat a disruptive class (as displayed in the Facebook meme). If you have any questions, then please leave them in the comment section here or the video YouTube channel. This is the time of year when my district begins sending out emails concerning teacher summer school positions and school transfer opportunities. Whether you're a novice or veteran teacher, it is always a great idea to prepare for an upcoming interview. In this post, I share 5 tips - in video and writing - that you can immediately implement to help you toward your goal of obtaining a teaching position. I share these teacher interview tips based on my expertise as a teacher and as a former district-level specialist and a high school campus assistant principal. Want to fast forward? See the time stamps below the video. If you've taken the time to apply to a campus, then you should also take some time to research information about it. Some districts have a district-wide application process where individuals select campuses they're interested in rather than applying to the campus directly. If you decided to select a bunch of campuses, then be prepared to spend some time researching each campus. I was always baffled with candidates that would show up for an interview and then confess to the committee that they knew nothing about the school. Use Google (it's your friend) to find the campus website or other news about it. Most campuses have general information such as who the current administrators are, the bell schedule, and news for parents. As stated in the video, you do not need to memorize every single detail; however, having some general knowledge about the school shows that you're at least interested in the possibility of becoming a member of the faculty. You also will not be caught off guard concerning certain facts if you're hired and show up on Day 1 of the job (such as the instructional time frame, demographics, school achievement status, etc.). Furthermore, researching information about the campus may provide insight to potential questions that the interviewer or committee might ask you. For example, if you notice the campus has a high ELL (English Language Learner) population, you could prepare yourself to receive potential questions about ELLs. Moreover, that information may at least provide you with information to speak to about at another time during the interview (refer to Tip #5). --state exams, AP scores, etc. Usually, the interview will begin with the interviewer/committee asking you to talk a little bit about yourself. This is a generic, yet open-ended question. As I mentioned in the video, I recommend talking about your higher education experience and your teaching background. You are not required to share personal information with the committee. In fact, this is where I have seen a lot of interviews go completely off the tracks because the candidate was too revealing in his or her personal life (sometimes on the verge of being inappropriate). If you stick to your own schooling and teaching experience, then very little can go wrong. Keep it short, simple, and sweet. Don't panic if you're looking for your first teaching job - speak to your student teaching experience and your enthusiasm to start your journey as an educator. Share personal information only if you can connect it to your career as an educator. Develop an idea of your instructional framework, policies and procedures, and classroom climate. 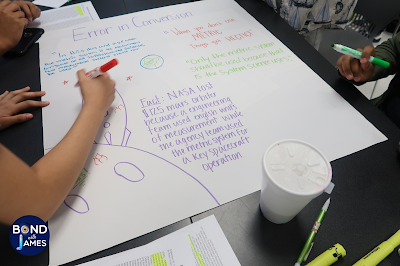 Most teachers were taught to develop lesson plans using a specific model, for example, the 5E Model (Engage, Explore, Explain, Extend, and Evaluate). You could reference the 5E sequence, or another model, to talk about what an administrator might observe as s/he enters your classroom for an observation. Highlight what the students, as well as yourself, are doing throughout a sample lesson (this will also help those that have to present a sample lesson during the interview). If you're asked to talk about a weakness, then speak to something that many people struggle with. For example, I sometimes participate in multiple campus-related events and spread myself thin. I have to continually remind myself that I cannot do it all. However, in the process of sharing a "weakness", I have also spun it around to highlight an effective teacher characteristic - being a collaborative faculty member. As a former administrator, I appreciated teachers that assisted the admin team or their colleagues in various ways. How do you handle disruptive students? You notice a student acting weird, possibly under-the-influence [of drugs or alcohol], describe how you would handle the situation. Describe how you would work with a student that is not disruptive but disengaged from the learning in your classroom. Describe how you would work with a parent or guardian that has complained about your grading practices. Describe your idea of effective communication with parents and other staff members. How do you maintain confidentiality between students? Describe your thoughts on addressing equity in your classroom or within your department. What are some ideas that you have that would help close the achievement gap among students at the campus? 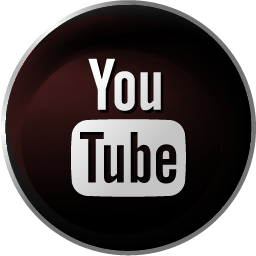 As discussed in the video, you can visit the description section in the YouTube video to download the Teacher Interview Checklist for additional questions and support. If you had a troubling experience at a former or current campus, then it might be easy to fall into the trap of saying something that might be viewed as negative by the interviewer/committee. Try to remain neutral and as general as possible when replying to questions that might incite a negative response. For example, you might be asked to share a time when you and a colleague, or administrator, were in disagreement with one another. 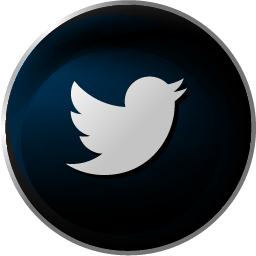 You can speak in general terms regarding how you would resolve the disagreement. Prior to going into any interview, develop a list of qualities and experiences that you believe make you the best candidate for the position. Whether you're given time at the end of the interview to share additional information, or ask questions, make sure to take a moment to highlight your strengths. If you did your homework (Tip #1), you might have learned some things about the campus that are aligned to your strengths. For example, if you have experience working with English Language Learners (ELLs) and are interviewing at a campus with a large ELL population, then highlight that experience and any successful strategies during the interview. Or if the campus is a 1-to-1 technology campus and you are a technological wiz, then talk about some of the innovative things you might use the technology for. Don't throw buzzwords out during the interview for the sake of it; especially if you don't truly believe in or even execute the strategies. For example, if you don't use word walls and have no interest in using word walls, then do not pretend to like them because you think that will get you bonus points during the interview. Furthermore, if you are offered the position, then there might be an expectation that you follow through with the skills that you used to promote yourself during the interview process. Well, that's it! I hope you were able to take away at least 1 thing from this list (blog and/or video). If you have a question about something you wish I would have spoken about, then make sure to a leave a comment. Thank you for taking time out of your day to stop by and Bond with James!